Attn: Sprint Fans, Tim Shaffer will be hot lapping his 410 Sprint tonight, let the excitement begin! Sprint fans...catch a free glance of the Steel City Outlaw roaring around the Monster tonight...you'll be back for the Sprint Monster! All Sprint teams are welcome to join us at practice tonight. 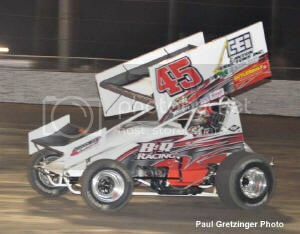 Tim Shaffer, "the Steel City Outlaw" will be on Hand for a shake down run with both cars in preparation for the Steel City Sprint Monster $5,000 to win Show Sat Sept 27! Tim will also be turning a few laps in his RUSH Crate Late he will be racing this weekend at the Monster! Isn't this his first sprint race ever ??? Maybe they will drop the free admission for tonight and charge $ 25.00 now. Since Shaffer signed with Renegades does that mean he can't run AllStars? 10 grand to win at Fremont tonight and he's gonna run his crate for $1200 instead? Maybe he's getting show up money as it seems that's a big sticking point with the ex AllStars. Way this is shaping up as usual the fans are the losers. Guys that do show at Fremont will gladly take the money Shaffer and the other boycotters didn't. 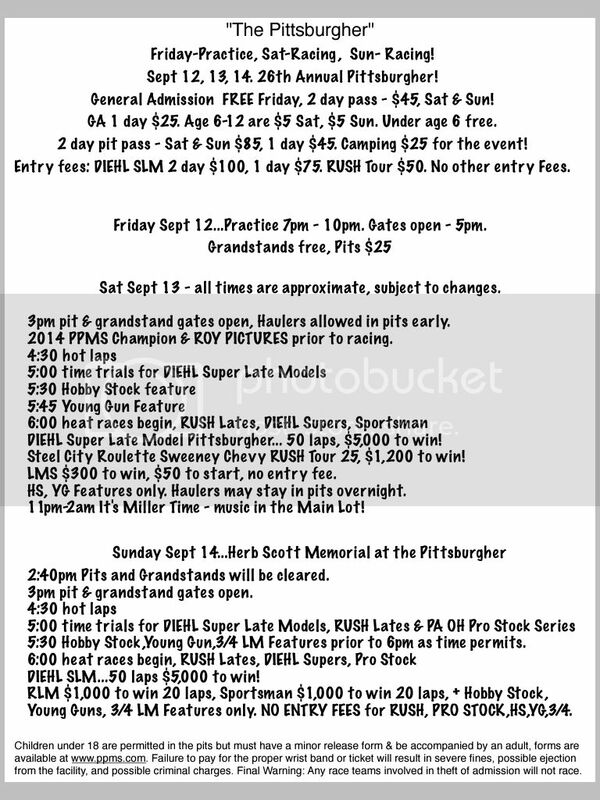 If you saw Shaffer hot lap at PPMS, YOU WILL BE THERE ON THE 27th. The Miley Motor Sports team has seen lots of Sprint racing, seeing Sprint Racing at PPMS is a whole different animal! 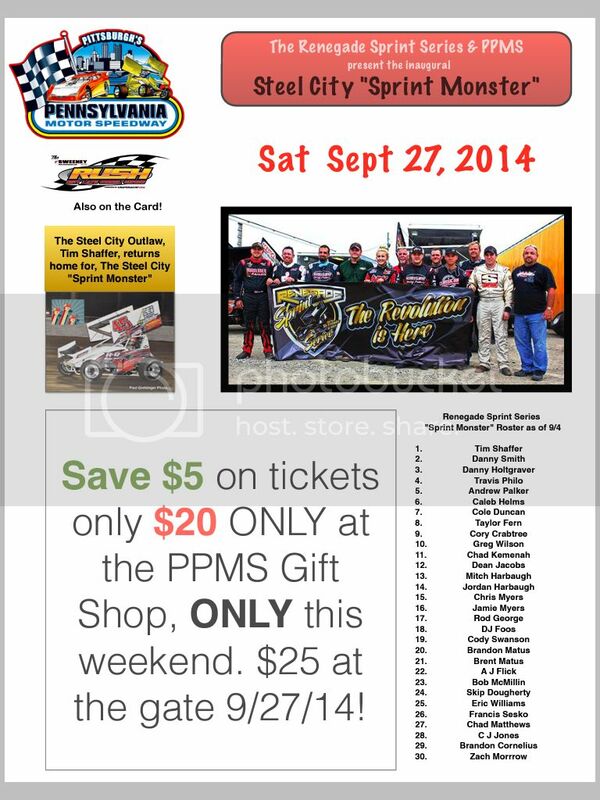 Sprint tickets only $20 at the PPMS Gift Shop this weekend. $25 at the gate 9/27. 1 more day, practice tonight, Schedule attached, Sprint cars welcome, a few may attend! Whose name will go on these?